This article is not the ultimate guide to Storm nor is it meant to be. Storm's pretty huge, and just one long-read probably can't do it justice anyways. Of course, any additions, feedback or constructive criticism will be greatly appreciated. A bird's eye view of how it works. 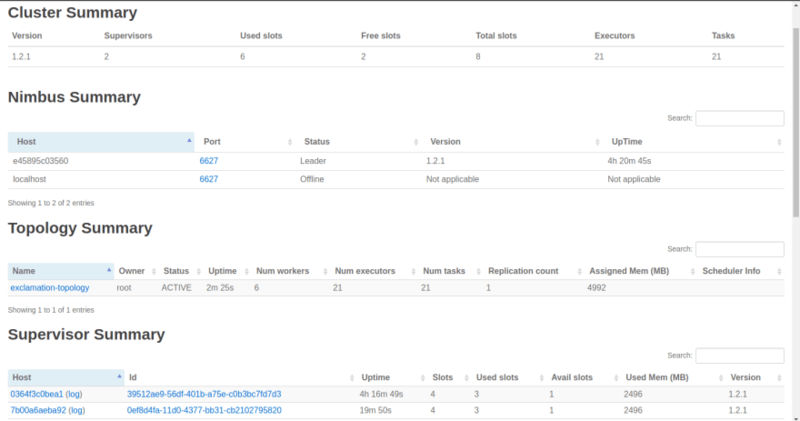 Setting up and playing with a production-worthy Storm cluster on Docker. A few words on message processing reliability. I'm also assuming that you're at least somewhat familiar with Docker and containerization. Continuous streams of data are ubiquitous and becoming even more so with the increasing number of IoT devices being used. Of course this data is stored, processed and analyzed to provide predictive, actionable results. But petabytes take long to analyze, even with Hadoop (as good as MapReduce may be) or Spark (a remedy to the limitations of MapReduce). Secondly, very often we don't need to deduce patterns over long periods of time. Of the petabytes of incoming data collected over months, at any given moment, we might not need to take into account all of it, just a real-time snapshot. Perhaps we don't need to know the longest trending hashtag over five years, but just the one right now. This is what Storm is built for, to accept tons of data coming in extremely fast, possibly from various sources, analyze it and publish the real-time updates to a UI or some other place without storing any itself. The architecture of Storm can be compared to a network of roads connecting a set of checkpoints. Traffic begins at a certain checkpoint (called a spout) and passes through other checkpoints (called bolts). The traffic is of course the stream of data that is retrieved by the spout (from a data source, a public API for example) and routed to various bolts where the data is filtered, sanitized, aggregated, analyzed, sent to a UI for people to view or any other target. 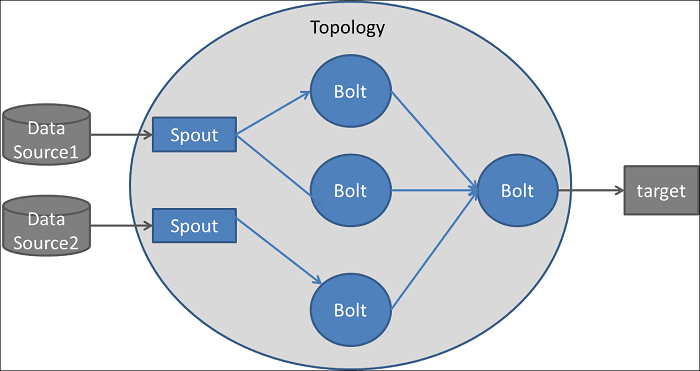 The network of spouts and bolts is called a topology, and the data flows in the form of tuples (list of values that may have different types). One important thing to talk about is the direction of the data traffic. Conventionally, we would have one or multiple spouts reading the data from an API, a Kafka topic or some other queuing system. The data would then flow one-way to one or multiple bolts which may forward it to other bolts and so on. Bolts may publish the analyzed data to a UI or to another bolt. But the traffic is almost always unidirectional, like a DAG. Although it is certainly possible to make cycles, we're unlikely to need such a convoluted topology. Installing a Storm release involves a number of steps, which you're free to follow on your machine. But later on I'll be using Docker containers for a Storm cluster deployment and the images will take care of setting up everything we need. While Storm does offer support for other languages, most topologies are written in Java since it's the most efficient option we have. // Tell Storm the schema of the output tuple for this spout. // It consists of a single column called 'random-digit'. // To output tuples from this bolt to the next bolt. // Tell Storm the schema of the output tuple for this bolt. // Get 'even-digit' from the tuple. // Attach the random digit spout to the topology. // Use just 1 thread for the spout. // Connect the even digit bolt to our spout. // shuffled/distributed among the 2 threads. // The third parameter is formally called the parallelism hint. // Connect the multiply-by-10 bolt to our even digit bolt. // even digit bolt will be shuffled/distributed randomly. // Create a configuration object. // The number of independent JVM processes this topology will use. // Submit our topology with the configuration. // The tuples with the same city name will go to the same thread. And of course there are other types of groupings as well. For most cases, though, the grouping probably won't matter much and you can just shuffle the data and throw it among the bolt threads randomly (shuffle grouping). Now there's another important component to this: the number of worker processes that our topology will run on. 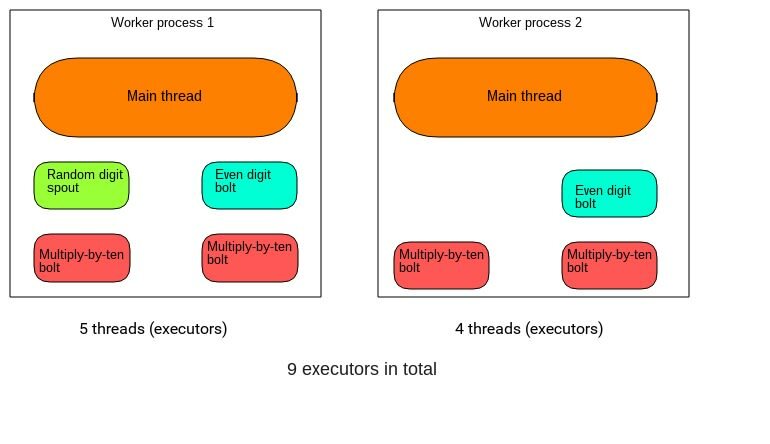 The total number of threads that we specified will then be equally divided among the worker processes. So in our example random digit topology we had 1 spout thread, 2 even-digit bolt threads and 4 multiply-by-ten bolt threads (7 total). Each of the 2 worker processes would be responsible for running 2 multiply-by-ten bolt threads, 1 even-digit bolt and one of the processes will run the 1 spout thread. Of course, the 2 worker processes will have their main threads, which in turn will launch the spout and bolt threads. So all in all we'll have 9 threads. These are collectively called executors. It's important to realize that if you set a spout's parallelism hint > 1 (i.e. multiple executors), you can end up emitting the same data several times. Say, the spout reads from the public Twitter stream API and uses two executors. That means that the bolts receiving the data from the spout will get the same tweet twice. It is only after the spout emits the tuples that data parallelism comes into play, i.e. the tuples get divided among the bolts according to the specified stream grouping. Running multiple workers on a single node would be fairly pointless. Later, however, we'll use a proper, distributed, multi-node cluster and see how workers are divided on different nodes. 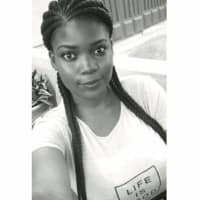 Maven is commonly used for building Storm topologies, and it requires a pom.xml file (The POM) that defines various configuration details, project dependencies etc. Getting into the nitty-gritty of the POM will probably be an overkill here. First, we'll run mvn clean inside yourproject to clear any compiled files we may have, making sure to compile each module from scratch. And then mvn package to compile our code and package it in an executable JAR file, inside a newly created target folder. This might take quite a few minutes the first time, especially if your topology has many dependencies. Hopefully, by now the gap between concept and code in Storm has been somewhat bridged. However, no serious Storm deployment will be a single topology instance running on one server. To take full advantage of Storm's scalability and fault-tolerance, any production-grade topology would be submitted to a cluster of machines. Storm distributions are installed on the master node (Nimbus) and all the slave nodes (Supervisors). The master node runs the Storm Nimbus daemon and the Storm UI. The slave nodes run the Storm Supervisor daemons. A Zookeeper daemon on a separate node is used for coordination among the master node and the slave nodes. Zookeeper, by the way, is only used for cluster management and never any kind of message passing. It's not like spouts and bolts are sending data to each other through it or anything like that. The Nimbus daemon finds available Supervisors via ZooKeeper, to which the Supervisor daemons register themselves. And other managerial tasks, some of which will become clear shortly. 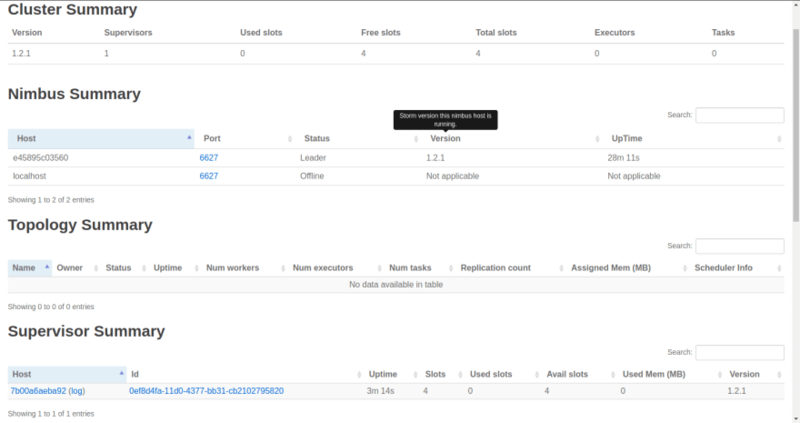 The Storm UI is a web interface used to manage the state of our cluster. We'll get to this later. Our topology is submitted to the Nimbus daemon on the master node and then distributed among the worker processes running on the slave/supervisor nodes. Because of Zookeeper, it doesn't matter how many slave/supervisor nodes you run initially, as you can always seamlessly add more and Storm will automatically integrate them into the cluster. then one worker process would have remained idle/unused. If the number of specified workers was 6 and the total allocated workers were 5, then because of the limitation only 5 actual topology workers would've been functional. If any worker on any slave node dies, the Supervisor daemon will have it restarted. If restarting repeatedly fails, the worker will be reassigned to another machine. If an entire slave node dies, its share of the work will be given to another supervisor/slave node. If the Nimbus goes down, the workers will remain unaffected. However, until the Nimbus is restored workers won't be reassigned to other slave nodes if, say, their node crashes. The Nimbus & Supervisors are themselves stateless, but with Zookeeper, some state information is stored so that things can begin where they were left off if a node crashes or a daemon dies unexpectedly. Nimbus, Supervisor & Zookeeper daemons are all fail-fast. This means that they themselves are not very tolerant to unexpected errors, and will shut down if they encounter one. For this reason they have to be run under supervision using a watchdog program that monitors them constantly and restarts them automatically if they ever crash. Supervisord is probably the most popular option for this (not to be confused with the Storm Supervisor daemon). Note: In most Storm clusters, the Nimbus itself is never deployed as a single instance but as a cluster. If this fault-tolerance is not incorporated and our sole Nimbus goes down, we'll lose the ability to submit new topologies, gracefully kill running topologies, reassign work to other Supervisor nodes if one crashes etc. For simplicity, our illustrative cluster will use a single instance. Similarly, the Zookeeper is very often deployed as a cluster but we'll use just one. # Run this service after 'zookeeper' and make 'zookeeper' reference. # Map port 8080 of the host machine to 8080 of the container. # To access the Storm UI from our host machine. # Host volume used to store our code on the master node (Nimbus). Feel free to explore the Dockerfiles. They basically just install the dependencies (Java 8, Storm, Maven, Zookeeper etc) on the relevant containers. The storm.yaml files override certain default configurations for the Storm installations. The line ADD storm.yaml /conf inside the Nimbus and Supervisor Dockerfiles puts them inside the containers where Storm can read them. # hosts in the Zookeeper cluster. We're using just one node, of course. # 'zookeeper' is the Docker Compose network reference. # Telling the Supervisor where the Zookeeper is. # in order to download the topology jars. # For each Supervisor, we configure how many workers run on that machine. # allocate up to four workers to run on this node. These options are adequate for our cluster. The more curious can check out all the default configurations here. Run docker-compose up at the project root. 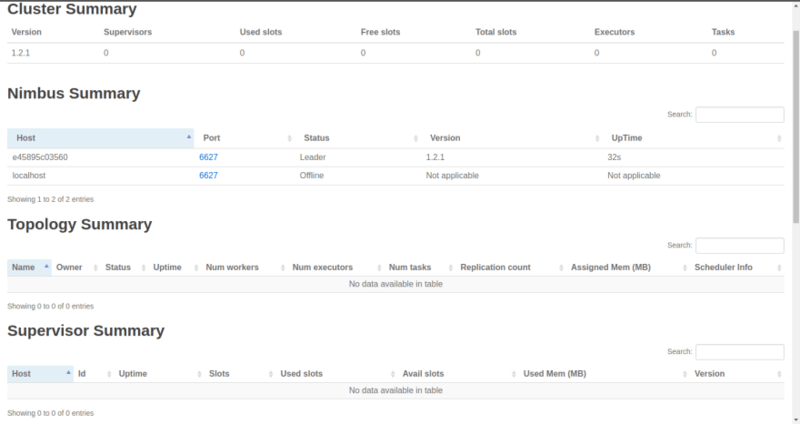 The Free slots in the Cluster Summary indicate how many total workers (on all Supervisor nodes) are available & waiting for a topology to consume them. Used Slots indicate how many of the total are currently busy with a topology. Since we haven't launched any Supervisors yet, they're both zero. We'll get to Executors and Tasks later. Also, as we can see, no topologies have been submitted yet. 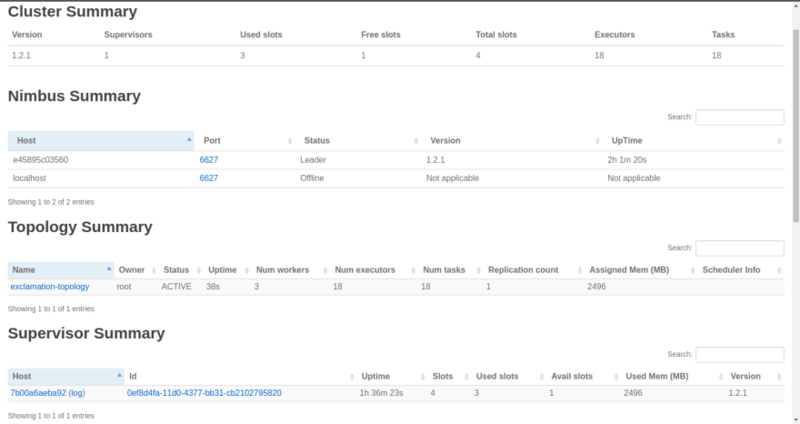 Note: Any changes in our cluster may take a few seconds to reflect on the UI. We have a new running Supervisor which comes with four allocated workers. These four workers are the result of specifying four ports in our storm.yaml for the Supervisor node. Of course, they're all free (four Free slots). Let's submit a topology to the Nimbus and put'em to work. SSH into the Nimbus on a new terminal. I've written the Dockerfile so that we land on our working (landing) directory /theproject. Inside this is code, where our topology resides. Our topology is pretty simple. It uses a spout that generates random words and a bolt that just appends three exclamation marks (!!!) to the words. Two of these bolts are added back-to-back and so at the end of the stream we'll get words with six exclamation marks. It also specifies that it needs three workers (conf.setNumWorkers(3)). 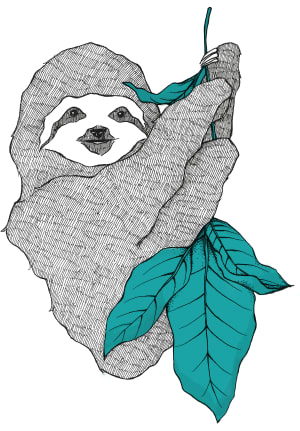 As soon as we submitted the topology, the Zookeeper was notified. The Zookeeper in turn notified the Supervisor to download the code from the Nimbus. We now see our topology along with its three occupied workers, leaving just one free. And 10 word spout threads + 3 exclaim1 bolt threads + 2 exclaim bolt threads + the 3 main threads from the workers = total of 18 executors. And you might've noticed something new: tasks. Another concept in Storm's parallelism. But don't sweat it, a task is just an instance of a spout or bolt that an executor uses; what actually does the processing. By default the number of tasks is equal to the number of executors. In rare cases you might need each executor to instantiate more tasks. // two objects of this bolt (total 4 bolt objects/tasks). This is a shortcoming on my part, but I can't think of a good use case where we'd need multiple tasks per executor. May be if we were adding some parallelism ourselves, like spawning a new thread within the bolt to handle a long running task, then the main executor thread won't block and will be able to continue processing using the other bolt. However this can make our topology hard to understand. If any one knows of scenarios where the performance gain from multiple tasks outweighs the added complexity, please post a comment. We can clearly see the division of our executors (threads) among the 3 workers. And of course all the 3 workers are on the same, single Supervisor node we're running. Now, let's say scale out! If you refresh the UI you'll see that we've successfully added another Supervisor and four more workers (total of 8 workers/slots). To really take advantage of the new Supervisor, let's increase the topology's workers. Change the project version number in your pom.xml. Try using a proper scheme, like semantic versioning. I'll just stick with 1.2.1. You can now see the new Supervisor and the 6 busy workers out of a total of 8 available ones. Also important to note is that the 6 busy ones have been equallly divided among the two Supervisors. Again, click the topology name and scroll down. One question we haven't tackled is about what happens if a bolt fails to process a tuple. Well, Storm provides us a mechanism using which the originating spout (specifically the task) can replay the failed tuple. This processing guarantee doesn't just happen by itself, it's a conscious design choice and does add latency. // 'tuple' is the original one received from the test word spout. // It's been anchored to/with the tuple going out. // Explicitly acknowledge that the tuple has been processed. The ack call will result in the ack method on the spout being called, if it has been implemented. So, say, you're reading the tuple data from some queue and you can only take it off the queue if the tuple has been fully processed. Well, the ack method is where you'd do that. You can also emit out tuples without anchoring: _collector.emit(new Values(exclamatedWord.toString())) and forgo reliability. ii) The fail method is explicitly called on the tuple in a bolt: _collector.fail(tuple). You may do this in case of an exception. In both these cases, the fail method on the spout will be called, if it is implemented. And if we want the tuple to be replayed, it would have to be done explicitly in the fail method by calling emit, just like in nextTuple(). When tracking tuples, every one has to be acked or failed. Otherwise, the topology will eventually run out of memory. It's also important to know that you have to do all of this yourself when writing custom spouts and bolts. But the Storm core can help. For example, a bolt implementing BaseBasicBolt does acking automatically. Or built-in spouts for popular data sources like Kafka take care of queuing and replay logic after acknowledgment and failure. Designing a Storm topology or cluster is always about tweaking the various knobs we have and settling where the result seems optimal. There are a few things that'll help in this process, like using a configuration file to read parallelism hints, number of workers etc so you don't have to edit and recompile your code repeatedly. Define your bolts logically, one per indivisible task, and keep them light and efficient. Similarly, your spouts' nextTuple() methods should be optimized. Use the Storm UI effectively. By default it doesn't show us the complete picture, only 5% of the total tuples emitted. To monitor all of them use config.setStatsSampleRate(1.0d). Keep an eye on the Acks and Latency values for individual bolts and topologies via the UI, that's what you want to look at when turning the knobs. Though I did not know apache storm, I enjoyed reading your post about it! I like that you explained the topology in a clean way with a really good example of bolts and spouts. This helped me figure that apache storm would fit very well in my upcoming project. So thanks for the clear examples and the good explaination! Thanks Robin! 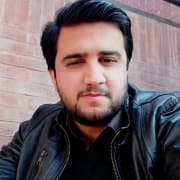 Hope it served as a nice intro, and good luck on your project.